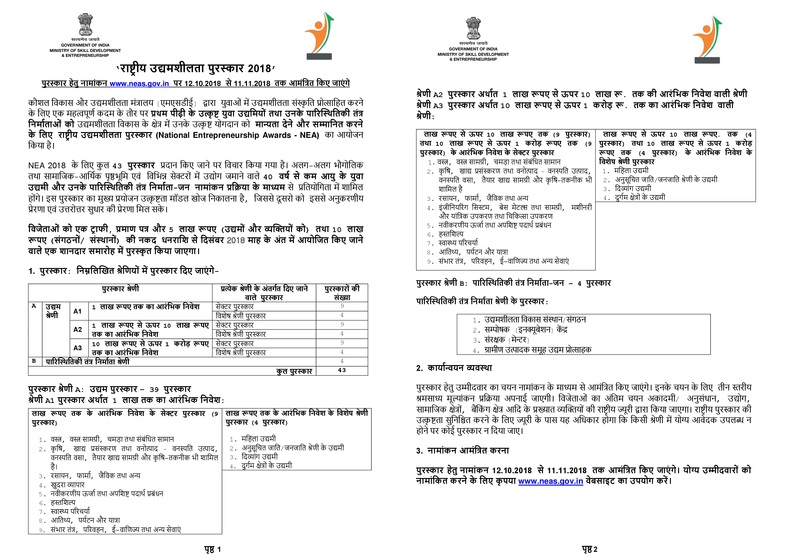 Ministry of Skill Development and Entrepreneurship (MSDE) invites nomination for the National Entrepreneurship Awards 2018. This Award aims to recognize and honour outstanding first-generation entrepreneurs below the age of 40 years and their ecosystem builders for their outstanding contribution in the field of entrepreneurship development. Nominations can come for the enterprises across three different levels of initial investment i.e. ₹ 1Lakh, ₹ 10Lakh and ₹1 Crore. A total of 43 Awards have been carefully considered from across the sectors, geographies and socio-economic categories. The Awardees will be presented a Trophy, Certificate and a Cash Prize of ₹5 lakh to ₹10 Lakh, in a high profile Award Ceremony in the end of December 2018. A brief note on NEA in English and Hindi language is appended below. 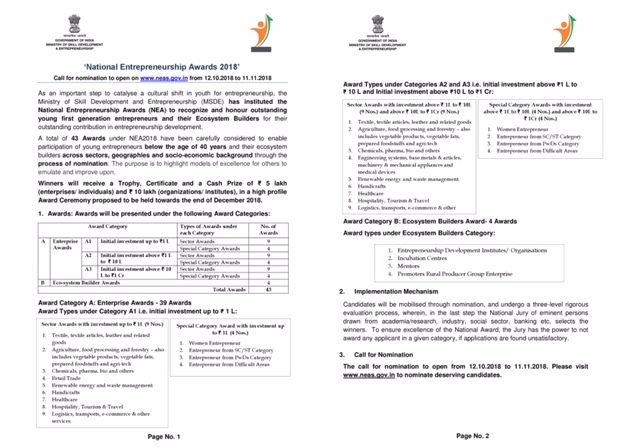 The Ministry urges you to nominate us suitable entries for entrepreneurship award. Call for nomination to open on www.neas.gov.in from 12.10.2018 to 11.11.2018. Please visit this website to nominate deserving candidates or write to us at info@texskill.in. Your valuable contribution in this regard would go a long way in the fulfillment of our national endeavor for the promotion of youth entrepreneurship.